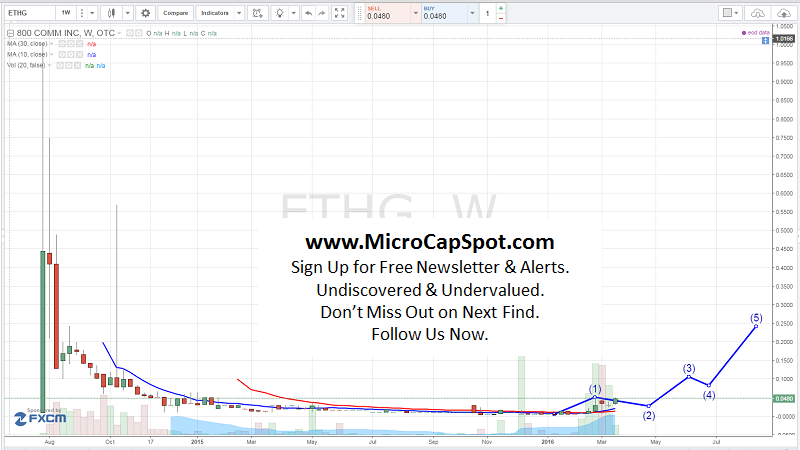 800 Commerce Inc (OTCMKTS:ETHG) investors have reason to be excited given recent developments taking place at ETHG. The company has been undergoing significant transformation and has now just announced that it is changing its name to Petrogress, Inc. The company announced the name change because it better represents its new business and operations. ETGH announced that it had acquired 100% of Petrogres Co. Limited and all subsidiaries and assets under it. This company operated in the oil and liquefied natural gas industry and provides shipping services to these industries. It has operations in the Marshall Islands, Greece and new subsidiaries within the United States. This new business had over $20 million in oil and shipping sales in 2015. If oil prices continue to rebound and have put in a low, this company could be set for some huge gains in the future. Petrogres has become a majority player as an oil commodity and integrated company in West Africa. Petrogres provides the supply of crude oil that is shipped by its owned tanker fleet and delivered to the local refineries and buyers. The Company plans to expand this proven model of its operations/business to other continents over the near term. The former CEO of ETGH stated that he has wanted to turn the company into something greater that could provide shareholders with even greater returns. Over the years, Friedman has worked hard to limit toxic debt financing, become a fully reporting company, and have a structure in place where it could eventually up-list to a more senior exchange. After several attempts and deeper reviews, the company did not have substantial enough revenues or growth to meet its goal. However, it strongly believes that Petrogres is the right partner with over $20 million in revenues to launch this company to the next level. The former CEO will continue to advise and assist the new CEO and manage existing relationships. In addition, Friedman plans to continue to be CEO of Agritek Holdings an entity that was spun-out of ETGH. Over the last six months or so ETHG has been signing Letters of Intent into unusual industries for a credit card processing company. As we take a closer look at ETHG, there are several interesting revelations that have been discovered. About four months ago, ETHG signed a letter of intent to acquire a winery estate. The intended purchase included all the assets of the winery operation, including over 80 acres of agricultural land, bed and breakfast, premium wine brands, operating wine club, retail and e-commerce sales located in California. However, the deal fell through and the purchase cancelled. Even more recently, ETHG announced that has signed another letter of intent to acquire BioSense Medical, LLC. BioSense is a medical device and healthcare data management company that currently generates millions in revenue through direct sales and marketing operations in the US as well as distribution partnerships globally. BioSense has been investing significantly in the diabetes front and improving the experience of people with diabetes. ETHG is currently trading at a $1.2 million market valuation. The company has undergone a significant transformation with the prior CEO on its way out. ETGH now has substantial assets and revenue base that will hopefully propel the company to the next level. Stay tuned as this story is just beginning to unfold. We will be updating on ETHG when more details emerge so make sure you are subscribed to Microcapspot so you know what’s going on with ETHG. Disclosure: we hold no position in ETHG either long or short at the publication of this article and we have not been compensated for this article.